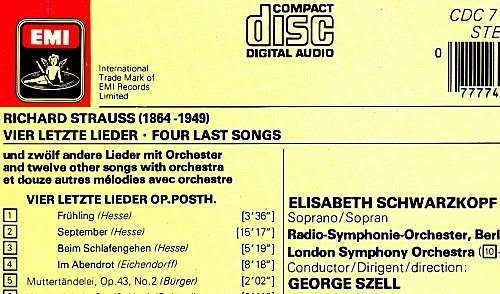 Staying with Born to be Wild reader John Shimwell shares with us EMI's CD transfer of Elisabeth Schwarzkopf singing Strauss' Four Last Songs. As can be seen above, the addition of a digit prolongs September by ten minutes. I wonder if Norman Lebrecht wrote the sleeve notes? David Cavlovic commented via Facebook "Well, she did like slow tempi." And to keep the record (CD?) straight the EMI CD transfer uses the sleeve notes that William Mann provided for the original LP release of Schwarzkopf's Four Last Songs.